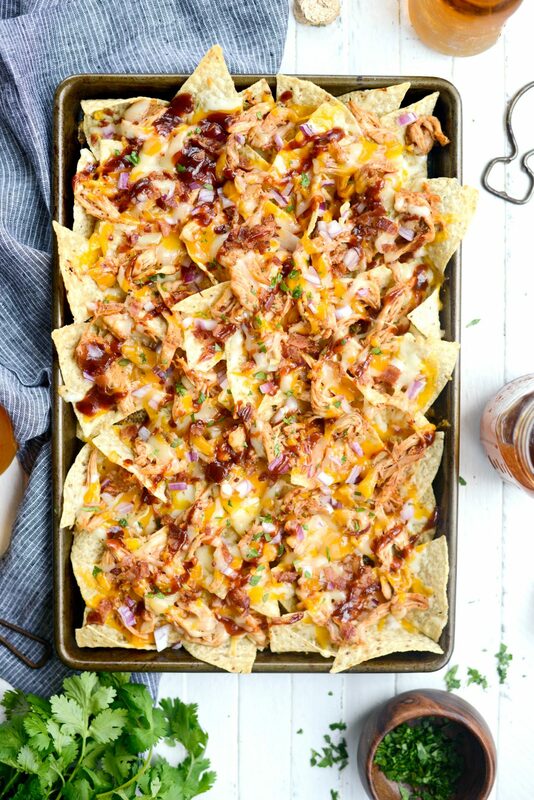 Inspired by one of my favorite pizzas, these Sheet Pan BBQ Chicken Nachos are unbelievably delicious. 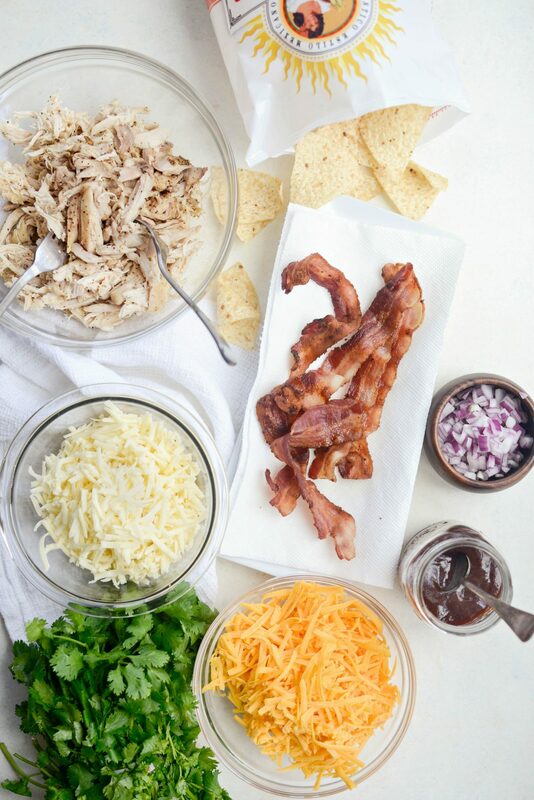 Tortilla chips are topped with chicken (that’s tossed in my go-to homemade sweet barbecue sauce), cheddar and Monterrey Jack cheeses, onions, bacon and more barbecue sauce. 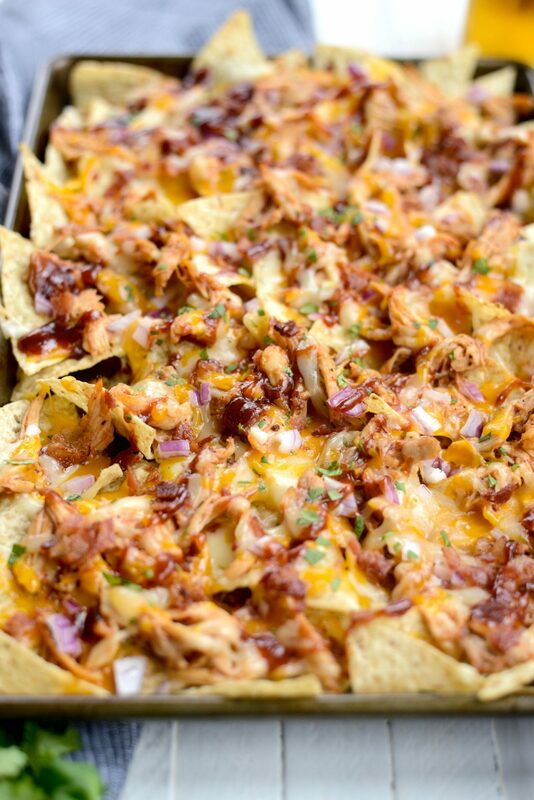 Baked until the cheese melts and the sauce caramelized — topped with minced cilantro for the ultimate BBQ chicken nachos! I remember the first time I tried barbecue chicken pizza. At first I couldn’t fathom chicken on a pizza let alone barbecue sauce instead of classic marinara. What I didn’t know, is that it was a sweet barbecue sauce (my favorite!) and that bacon is involved. Because as we all know, bacon makes everything 10 times more delicious. It’s a no-brainer. 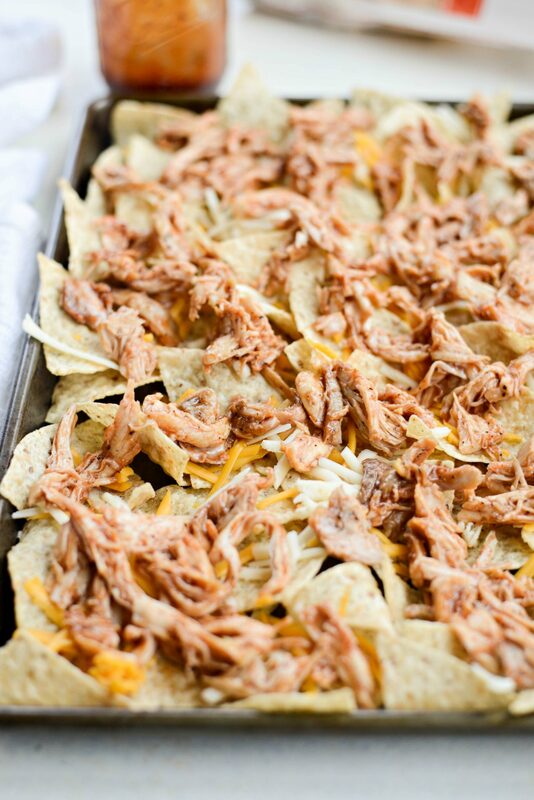 So these nachos happened by accident a few weeks ago – I love it when that happens! I was making my family BBQ chicken sliders and at the last minute I worried there wouldn’t be enough because the rolls were so dinky. So I decided to throw what I didn’t use in the sliders on to corn tortilla chips. I kind of figured it would be delicious, but I was really surprised how much I liked them. More like loved them.. A LOT. I’m sure I’m not the first blogger in the history of blogs to come up with this and I don’t care! 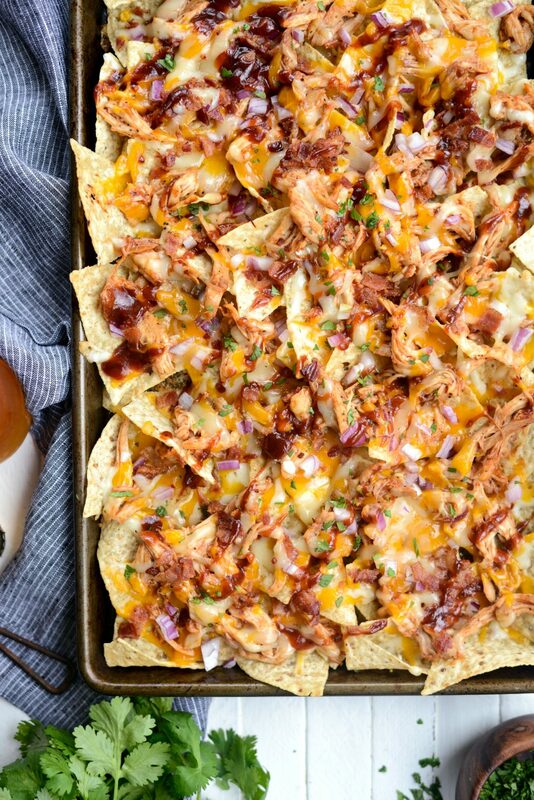 However, I do use my homemade sweet barbecue sauce and drizzle of it over top of the nacho so it will caramelize in the oven. 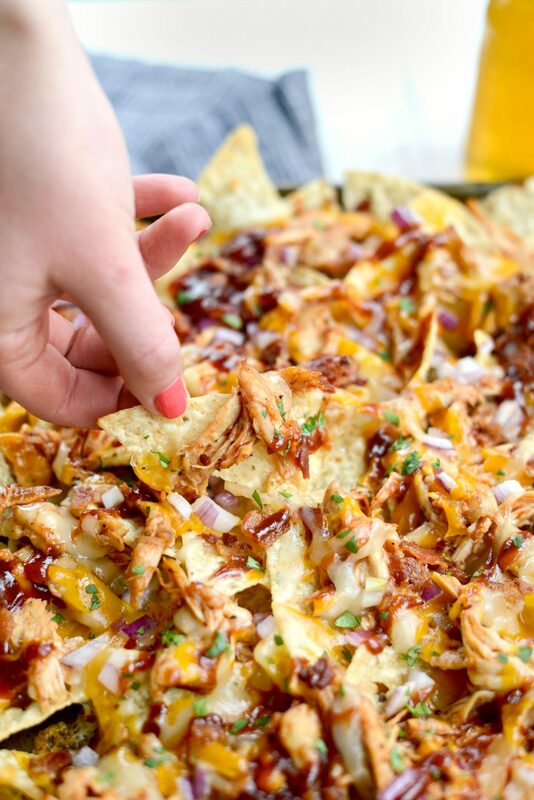 The caramelized sauce really makes these nachos. Promise. 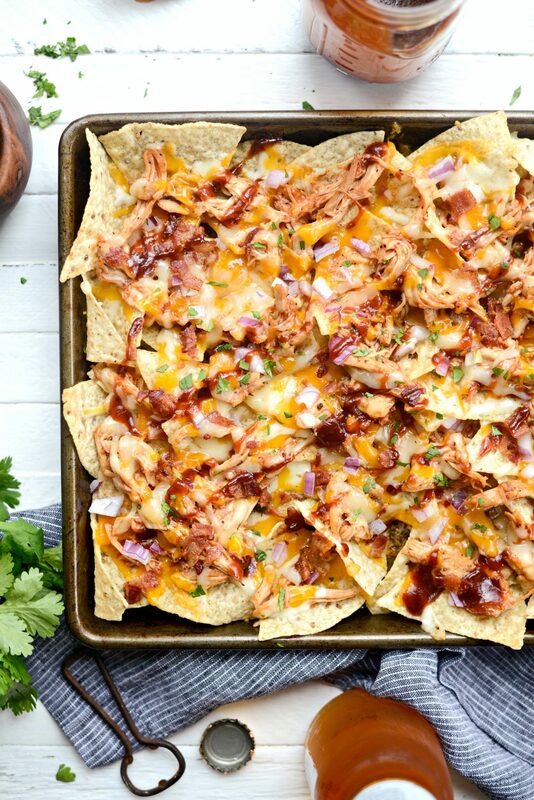 Here’s what you’ll need: corn tortilla chips, shredded cooked chicken, sweet barbecue sauce, cheddar and Monterey Jack cheese, red onion, bacon and cilantro. SO simple. 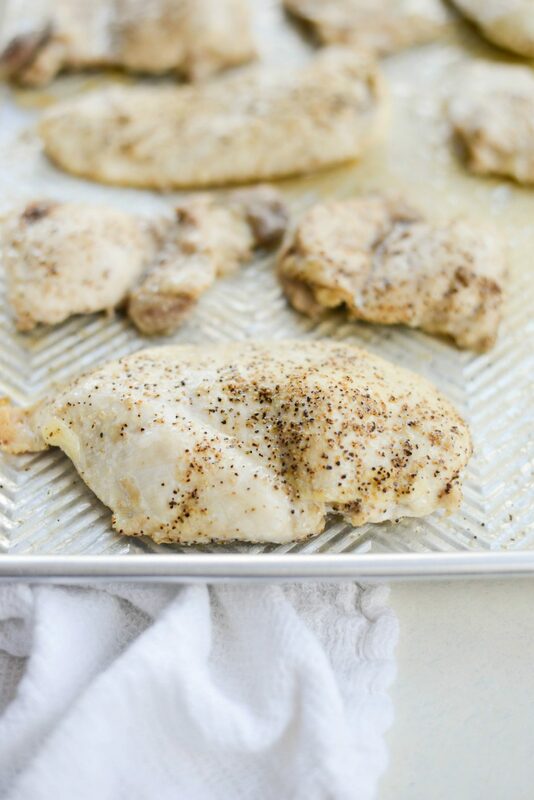 Preheat your oven to 400° and place the chicken onto a rimmed metal baking sheet. Drizzle with enough oil to coat (about 2 tablespoons) and season both sides with lemon pepper seasoning or salt and pepper is fine too. 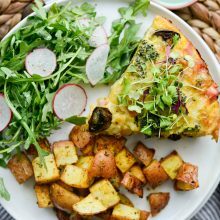 Arrange the chicken on the pan and slide onto the middle rack of your [preheated] oven and bake for 18 to 20 minutes or until fully cooked and no longer pink. Transfer the chicken to a cutting board to rest for a few minutes. Next, reduce your oven temperature to 325°. Once the chicken has rested, use a couple of forks to shred the chicken. 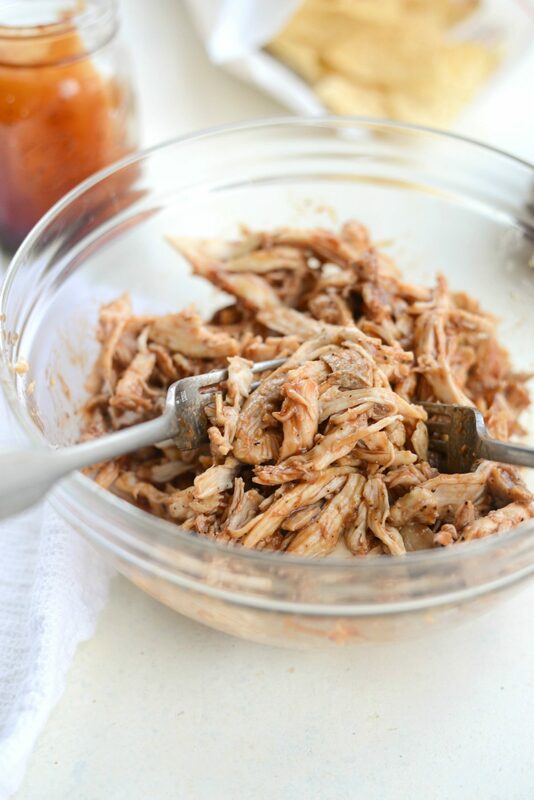 Pour in the sweet barbecue sauce and toss the chicken to coat. You want the chicken to be saucy but not overly saucy, you definitely don’t want it dry – I just eyeball it, but if I had to guess it’s around 1/2 to 3/4 of a cup. 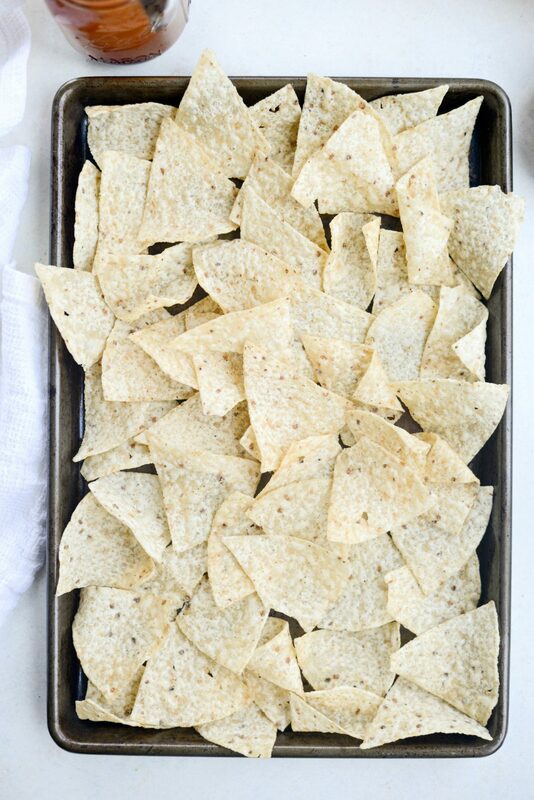 Arrange corn tortilla chips in a single layer onto a rimmed metal baking sheet. Sprinkle a little of the cheese over top of the chips before scattering the saucy barbecue chicken. Top with more cheese, sprinkle with finely dice red onions and bacon before drizzling more sauce over the top. Slide the pan onto the middle rack of your 325° oven and bake for 10 to 15 minutes or until the cheese has melted and the sauce has caramelized. Sprinkle this glorious mess with finely chopped cilantro and serve immediately. 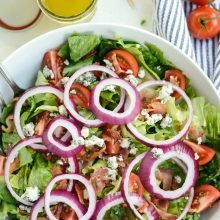 The sweetness of the sauce is cut by the sharp red onion and the crispy bacon. And the cheesy-ness is unreal! 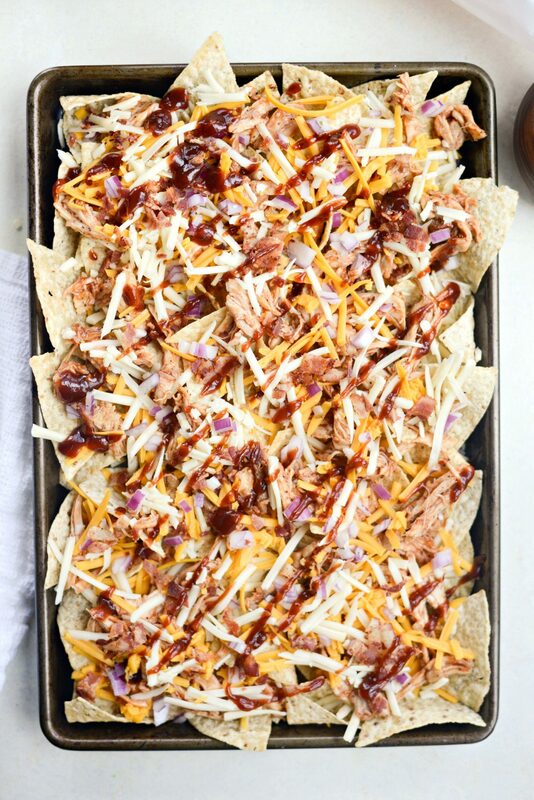 Pat likes his sheet pan BBQ chicken nachos with extra barbecue sauce on the side. I like mine with an ice cold beer. 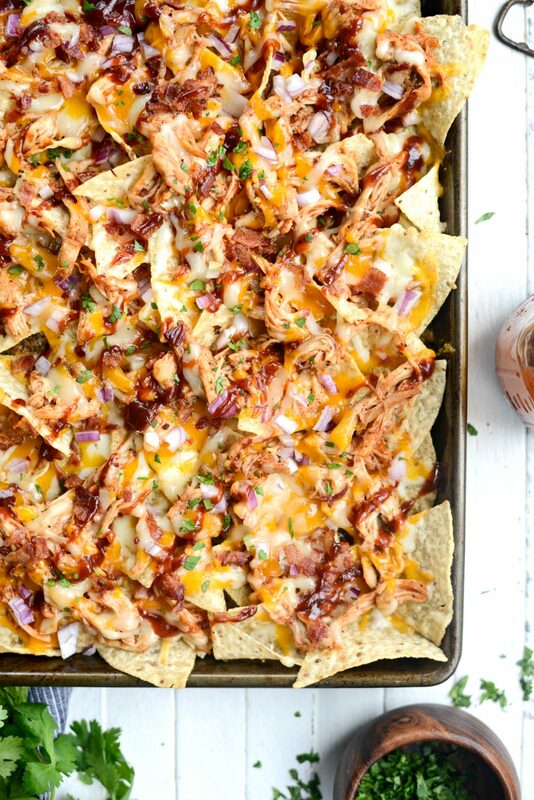 I sincerely wish you could reach through your screen and sample these sheet pan BBQ chicken nachos right now. 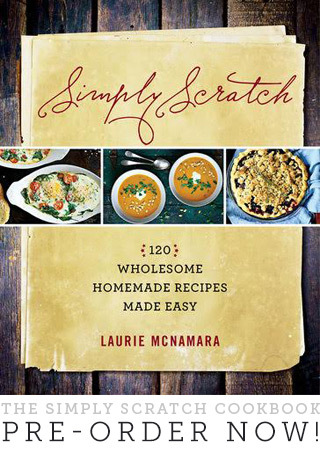 So dang good, I’m thinking of making them for lunch with my leftovers. And I’m not even mad about it. Enjoy! 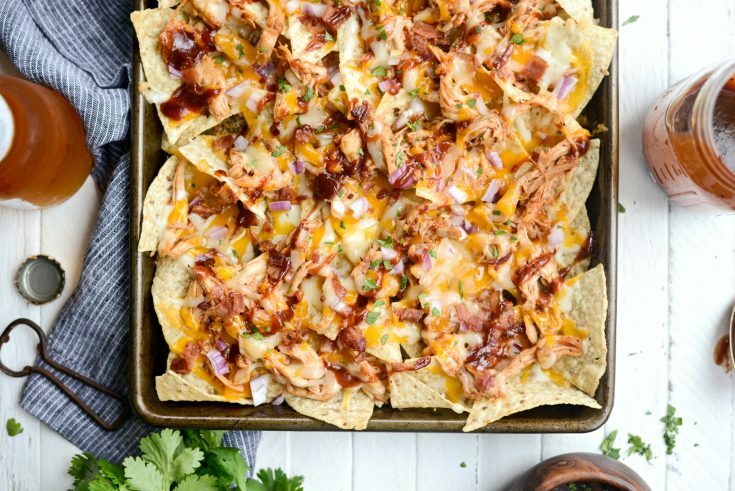 And if you give this Sheet Pan BBQ Chicken Nacho a try, let me know! Snap a photo and tag me on twitter or instagram! In a skillet, cook the bacon until crispy and drain on to paper towel. Once cool, finely chop into small pieces. Meanwhile, on a rimmed metal baking sheet arrange the chicken, drizzle with olive oil and use tongs to toss and coat. Season both sides with the lemon pepper seasoning before sliding trepan onto the middle rack of your oven. Bake the chicken for 18 to 20 minutes or until the chicken is fully cooked. 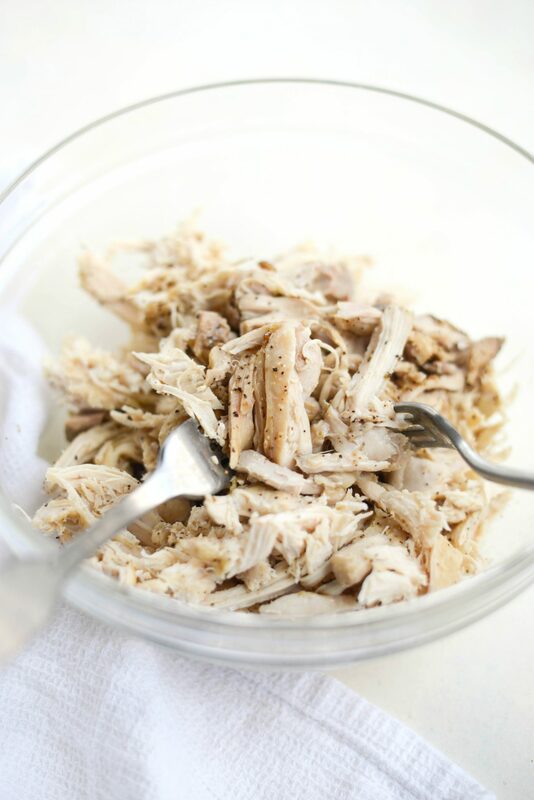 Once cooked, remove the chicken to a cutting board to rest for about 5 minutes before shredding with two forks and transferring to a bowl. 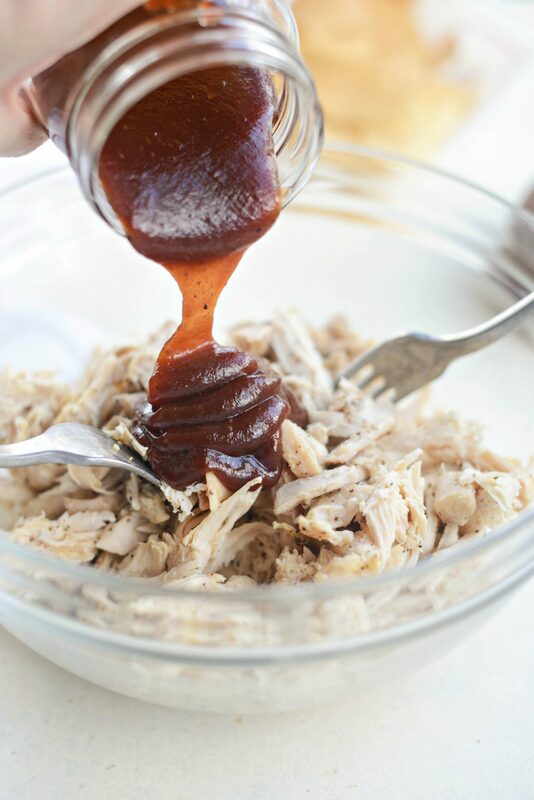 Pour in 1/2 to 3/4 cup [give or take] of barbecue sauce and toss thicken to coat. Reduce the heat of your oven to 325°. 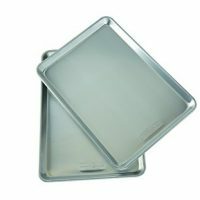 On a [clean] rimmed metal baking sheet, arrange chips in a single layer. Top with a light sprinkle of cheese before scattering the barbecue chicken over top. Then top with more cheese, red onion and chopped bacon. Drizzle a little extra sauce overtop before sliding the nacho onto the middle rack (double check that you've reduced the temp!) 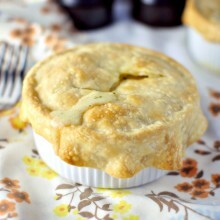 and bake for 10 to 15 minutes, or until the cheese has melted and the barbecue sauce is caramelized. 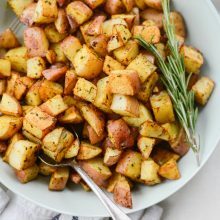 Sprinkle with cilantro and serve immediately! 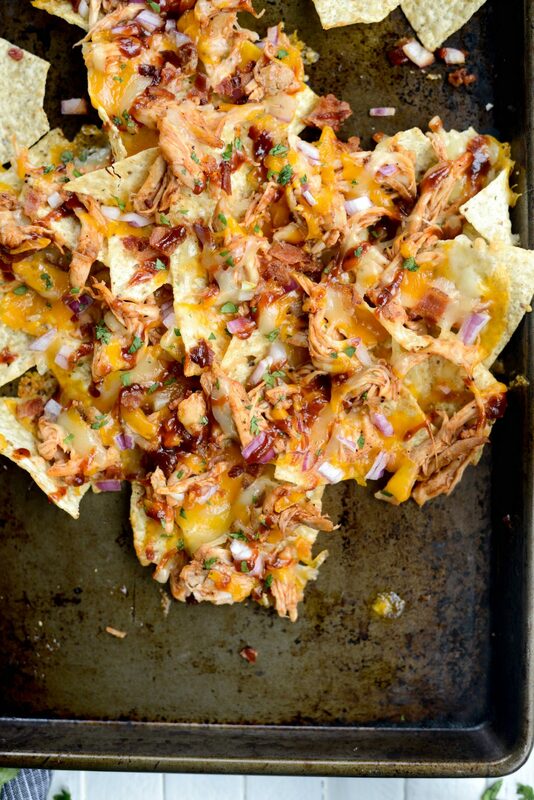 **This makes a two quarter or half sheet pans of nachos. 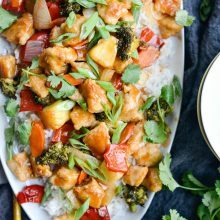 I made these for dinner two Saturday’s ago and they were SOOO good! Yay! I’m so happy to hear it, Kelli! 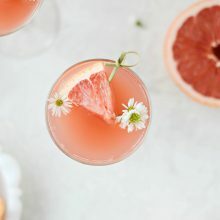 Absolutely delicious and easy! Will make again! Tastes like restaurant. I added a can of pinto beans for extra. I’m so glad, Mara! Thanks for taking the time to make these nachos!